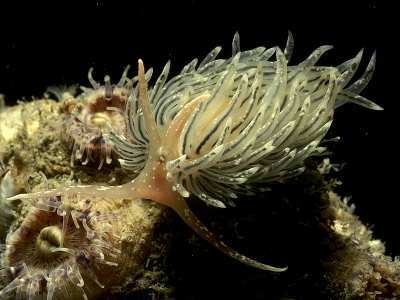 MOLLUSCA : NUDIBRANCHIA : Facelinidae SNAILS, SLUGS, ETC. Description: The body is translucent white with a pinkish hue over the head and tentacles. The red oesophagus is visible through the epidermis. Often there is a small patch of white pigment between the rhinophores. White speckling is present on the head, tentacles and cerata. The tips of the cerata are covered with yellow/white pigment. The oral tentacles are very long and mobile and the rhinophores are smooth. Adult specimens usually range in length between 17-38mm. Habitat: Thought to feed on Tubularia larynx and possibly other hydroids. Distribution: The only British records are from Lough Hyne, SW Ireland, elsewhere it has been reported from Arcachon in the Bay of Biscay and the Mediterranean Sea. A record of this southern species from Denmark must be considered doubtful. Similar Species: Facelina bostoniensis is similar, but the annulate rhinophores of F. bostoniensis distinguish it from F. dubia. Propodial tentacles, long oral tentacles and smooth rhinophores present. Cerata with patches of dark surface pigment. Picton, B.E. & Morrow, C.C. (2016). Facelina dubia Pruvot-Fol, 1949. [In] Encyclopedia of Marine Life of Britain and Ireland.